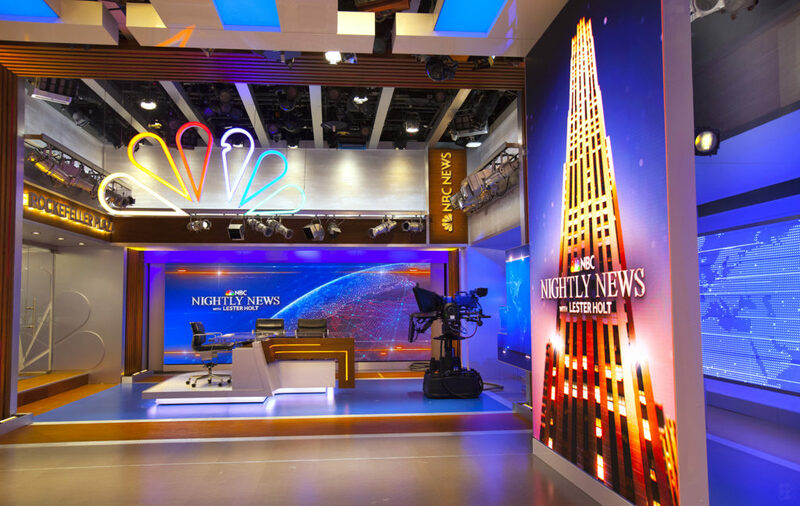 With an eye toward using vibrant and dynamic storytelling walls in a flexible environment, “NBC Nightly News” will debut a new studio at Rockefeller Plaza tonight that blends a variety of LED panels with hard scenery and combines looks from the broadcast’s past with new visual motifs. The move returns “Nightly” and anchor Lester Holt to the footprint of Studio 3C after a six-year residence in Studio 3B. Previously housing MSNBC and now known as part of 3A, local newscasts on WNBC and “Nightly,” the studio has been completely revamped with a technology-driven storytelling environment that reconnects NBC News and MSNBC through a unified work space and window, a nod to the studio’s original 2007 design. The space includes 632 square feet of LED video tiles, according to an NBC News spokesperson, including a unique layered collection of cubes and rectangles and a “stacked block” arrangement to the right of this. A double-height LED column, nicknamed “the tower,” also gives the venue a dramatic canvas to display graphics, including the towering 3D rendering of 30 Rock found in the show’s open. The video walls are reminiscent of the large panels the network installed and later expanded in Studio 4E, a working newsroom space upstairs from this studio, which is used for a variety of both MSNBC and NBC programs. Warm wood tones and metal finishes connect the space with previous design iterations, with slim vertical backlit reveals between slatted wood panels adding pops of light and color on camera. The studio, from Clickspring Design, also features multiple presentation venues for Holt, correspondents and guests. Blackwalnut fabricated the scenic elements with technology from Leyard and lighting by NBC’s in-house team. The new Studio 3C. Photos courtesy of John Makely/NBC News. 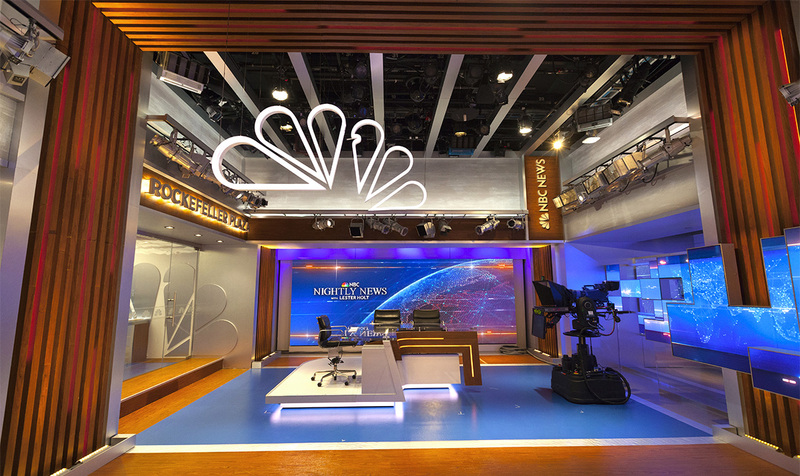 The L-shaped movable anchor desk features a curved design with wood and lighting accents, including an integrated NBC News logo. The design of the desk gives plenty of options for both anchor positions and in-studio guests and debriefs. Above, a color-changing peacock sculpture is suspended from the ceiling, but instead of being lined up in a single plane, each feather is positioned slightly behind its neighbor, so that the sculpture morphs as one views it from different vantage points. To the left of the anchor desk is the glass door and window wall overlooking workstations of Studio 3A, home of MSNBC, which has been updated with new graphics and additional LED technology ahead of this launch. Framing out this area are oversized NBC peacocks finished in a sleek silver and mounted on a wall of the same shade — creating a modern, monochromatic look.